1. How come the GTO looks like a Grand Prix, Cavalier or a 95 Mustang? The 2004 GTO is the result of GM��s Big Boss Bob Lutz��s view of what the GTO would have probably evolved into had Pontiac never stopped producing it. It is of course, based on the Holden Monaro, a 2 door rear drive LS1 powered coupe. 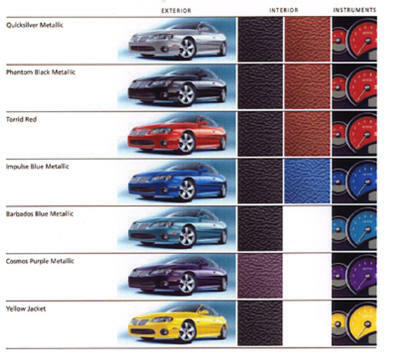 Holden is GM��s Australian subsidiary. So yes, your GTO is built in Elizabeth, Australia. When Lutz saw the Monaro, he figured they could easily use that as a new GTO and revive the nameplate. While some view this as a ��stopgap�� measure, the car chosen does live up to the legend and betters the originals in performance. Styling is subjective, as many view it as ��boring�� and not ��aggressive��. Keep in mind, that GM had 18 months to get the car from Australia to here, and changed very little�Kmost of the changes involve things unseen with internal parts, moving the gas tank into the trunk, and increased seals to get the car to survive the US�� winters and climates, as well as meeting US standards. Styling wise, the car is basically unchanged with mostly the front end looking more like a traditional Pontiac with it��s twin split ��kidney bean�� grills. In person, the car looks much nicer than it does in pics, and most of the people who bash it��s looks are probably letting nostalgia interfere with their view of what a GTO should look like. Remember, the original GTO��s were just ordinary sedans with honkin�� engines stuffed in ��em. While the GTO isn��t an ��in your face�� flashy car, it is quite handsome in person and looks nothing like the mentioned cars above. It may at a glance look like something, but people usually do a double take when they actually see one go by, because they are probably saying, ��What was that?�� Keep in mind that the hood scoops are rumored to appear on the 2005 models. 2. So, what��s under the hood then? The 2004 GTO has the LS1 V8, the same engine that has powered the C5 Corvette and the 98-2002 Firebirds and Camaros. Rated at 350 HP and 365 lbs of Torque, the new GTO has power aplenty. A Four speed auto trans is standard (the 4L360) and a six-speed manual is the only real option for the car. The manual trans is $695. But, beware�Kthe auto gets less gas mileage than the 6 speed, so a $1000 gas guzzler tax applies to the auto�Kso in actuality, the $695 optional transmission will save you about $305 over the car with the auto. There is a more powerful version of the GTO rumored for future, but if we shared the info, the suits at GM would be mad! 3. How much is a GTO? The GTO��s base MSRP is $31,795�Kplus a $700 destination charge, which brings us to $32,495,get the auto and we��re at $33,495 because of the gas-guzzler tax, and the 6 Speed��s is $33,190. Every GTO is fully loaded and there are no other options from the factory of note. 4. I don��t care for the rear spoiler. Can I take it off? Sure�Kbut then you have to fill in the holes in the trunk that the spoiler was attached to. I have seen one enterprising owner of a GTO online do this. At least the functioning 3rd brake light in the window will now make more sense. 5. How do you tilt the steering wheel? If your used to GM��s usual 30-year-old steering column and turn signal stalks the GTO is a bit different! Under the steering wheel, there is a lever. Pull down on the lever, and you will loosen the wheel, which you can now tilt or telescope accordingly�Kwhen you have your ideal position, just push the lever back up and it locks back in. Bet you thought you��d never see a telescoping wheel in a GM car huh? 6. Are the headlights as bad as I hear? While the GTO has projector beam headlamps, and they seem to illuminate a wider area of light, it seems that they all seem to be aimed a bit too low. Why this is the case, I really don��t know. It is an easy fix to adjust them via a plastic screw behind the headlamps themselves. Turn clockwise with a Phillips head screwdriver to raise the beams�Kdon��t go too high, or you��ll blind other drivers!! I wonder why the beams seem to be all aimed quite low. Anyone out there who knows the answer let us know. 7. Where are the power door locks? There are none�Kin the car that is. Yes, the ��Power door locks�� are simply the door knobs themselves�Kpush down on the driver��s side to lock both doors, pull up to unlock both. Or, you can use the key��s remote to lock/unlock the doors. On an interesting note, if you are leaving the car and want to lock the doors, you cannot push the knobs down while the door is open�Kyou need to close the door and use either the key itself or the remote transmitter��s lock button. This is to ensure you don��t lock your keys in the car�Ksince you can��t completely lock the doors from the outside without the key!! Good feature or bad, you decide. 8. I see my GTO has fog lamps�Kbut there��s no fog lamp switch! Where is it? Ah, you see, they hid it. Those rascally Aussies!! Seriously, it is on the headlamp knob�Kpull it out and voila!! Let there be fog lights! Push it back in to turn ��em off. If you look at the knob, you��ll see the fog lamp icon on the switch/knob�Kmost don��t notice it because in the US at least, most cars have a separate switch. 9. I can��t find the keyhole for the trunk. Where is it? Again�Kthere is none!! You can only pop the trunk through the key��s remote transmitter or through a little black button on the inside of the glove box to the left. Keep in mind; the car needs to be traveling less than 12 mph if you are in motion for the trunk release to work. So, I guess there��s no hiding your friend in there as a tail-gunner and speeding away from the bad guys, then popping the trunk as your friend laughs maniacally as he opens fire on the chasing evil doers with either an Uzi, or a Super Soaker filled with Pepsi. Sorry, it��s like 3 in the morning and my mind is starting to wander a bit. 10. You��ve said the key is on the remote? Yep, it��s one huge sucker too�Kthere is no separate remote keyless entry�Kthe key and remote is one unit and the key is special. The remote/key contains a transponder that will match an immobilizer control unit in your car�Kthink of it as PASS key without the pellet, you Vette and F-Body owners. Even if you could duplicate the cut of the key, without that transponder talking to the car�Kcar just won��t start. You knew your GTO was special right? See your dealer if you need a spare, as I don��t think you can walk into Wal-Mart and ask them to make a spare for ya. In fact, 20 points to the people who go to Wal-Mart and ask the clerk to make a spare. 30 Bonus points if the clerk actually tries. All attempted copies of GTO keys from Wal-Mart can be sent to the site and we��ll put ��em all up on a plaque�KI hope we don��t actually get any. You know I��m kidding right? 11. Along with my key/remotes, I also got another regular key? What��s that for? It��s for the glove box. That way, you can keep the key in there and should you have to lock the glove, you can do so and even give your valet your keys/remote and he can��t get into the glove box. The guy in Wal-Mart may be able to make a copy of this though you get no points if he does. Nor do we want your glove box keys, so don��t send those in either. 12. What��s that strange picture of a picnic table and a tree or something in the driver info display? I was hoping you wouldn��t ask. This allows you to set and customize features of your car and the trip computer along with either useful or un-useful features that you decide you want to keep. You can access this by pressing and holding the mode button on the trip computer while turning the key in your ignition to ON. There are quite a few selections, so you should really check out the owner��s manual for what all the features are and what they can do�KI know, the whole point of this FAQ was so you didn��t have to look at the manual right? Good point but, really the features are pretty self explanatory, and the car even TELLS you what the feature does�Kmore so than the manual�Kjust follow the instructions (and for those wise asses and less than savvy parties out there, the car doesn��t talk and tell you�Kit displays it on the screen of the instrument panel��s center display�Kyou��d be surprised at how many people will probably email and ask why their car doesn��t talk to them because they read it on an internet FAQ after this, hence the disclaimer). I��ll run through the features, but that��s it. Keep in mind that the trip computer /driver information center changes modes as you press�Kthe MODE button�Kkeep pressing and the displays under your gauges change accordingly�Ksimple, no? Underspeed Chime: Chimes when your speed runs under the overspeed limit you set after you go over it. In other words, the overspeed limit will go off when you go past a certain speed(you could program it to 55, so you know if you go over), the underspeed chime will go off when your speed goes back down below what you set. Dist To Arrival: For the trip computer�Kyour time to arrival, distance to arrival, and remaining fuel displays. Arrival Default: Default is 300 miles when reset . You can of course, set the distance yourself. Trip Computer A & B: You can have either one or two sets of Trip Time/Trip Distance/Fuel Used displays. Default is A. Stop Watch: No, you didn��t read that wrong�Kyou have a stopwatch. The Set button stops and starts�K.hold mode for a few secs to reset the stopwatch. 0-60? No need to use your watch your car will do it for you�Kgood luck pressing the button to start it, while launching your car at the same time. Rest Reminder: This is that tree/picnic table looking thing that pops up in the driver information center display. This is what started this whole section of this FAQ. It is just to remind you that you have been driving for 2 hours straight and should ��take a break��. I suppose looking at the clock would be a bit too obvious. J It��s cute though�KI kind of like it. Radio Display: This will give you audio system info such as CD track number, radio station, etc. Handy actually, it��s probably a few milliseconds quicker than turning all the way down to look at the radio display. Confirmation Beeps: Basically this sets whether your radio makes beeps during certain operations such as CD Loading, etc. Some people like beeps some don��t. You make your decision here. Speed Dependent Volume: You can turn it off, or adjust the sensitivity. I haven��t tried this yet; since I turned mine off�KI suppose some like the ability for your stereo to increase in volume the faster you go�Kgo for it if that��s you. Headlights Off Delay Time: When in Auto Mode, and you leave/turn off the car, how long you want the headlights to remain on. Default is 1 second. Headlight Approach Time: Basically the opposite of the above�Kwhen you unlock the doors, you can have the headlamps illuminate�Khandy if you��re the type of person that lives in pitch black areas at night and can��t see when you are walking up to your home, cave, trailer, cardboard box, whatever have you. Main light knob must be set to On or Auto. Auto Headlights Sensitivity: Allows you to set how sensitive the auto headlamps will react to lighting conditions�KDefault is Normal. Courtesy Lamp Timeout: Sets the length of time for the interior courtesy lamp after door is opened or unlocking car at night. Default is 30 secs. Ignition Off Courtesy lamp: Time of light remaining on when ignition is turned off at night only. Default is 37 minutes�Kjust kidding, it��s 30 secs. Two Stage Unlock: This allows you to either have both doors unlock when one is opened or one after another through the remote. Auto Lock in Drive: This is for the auto-equipped cars only: When in drive, the doors lock automatically�Knot sure at what speed before it trips. Door Lock Indication: This lets you decide if you want the horn to sound with chirps along with the parking/turn lamps to flash when you lock or unlock the doors, or just the parking/turn lamps to flash. Exit Option Menu: You gotta be kidding right? You can exit the customization from here. Another way to exit the programming is to drive the car past 6 mph, or turn off the ignition. 14. OK, how about the thing in the manual that states you can attach a cell phone to the radio and use it hands free with the sound from your phone coming from your speakers? Many people have wondered about this myself included. 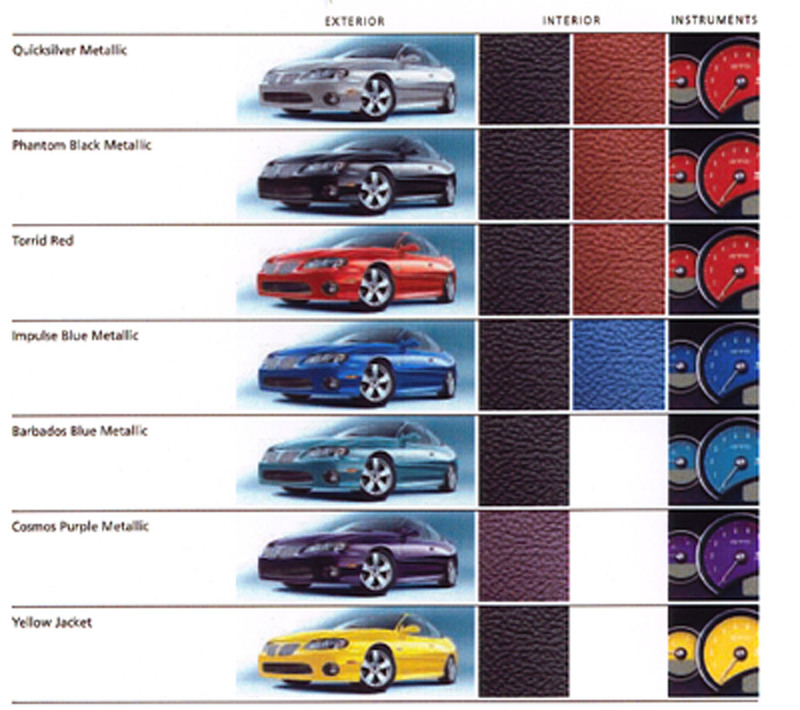 Pontiac seems confused, Blaupunkt seems confused, and we most of all as owners are the most confused. There is a wiring harness that can be bought that supposedly attaches to a suitable hands free kit for an unspecified phone. The first person that wants to try this out and get it right wins my respect and admiration. I emailed to Motorola about this concerning a handsfree kit they sell for my T720 and if it��d connect to the harness that GM sells�Kthey never wrote back. More on this later. If anyone has successfully found a kit that does work with the GTO��s radio, please let me know so I can sleep at night. 15. How come the GTO has no dead pedal? Pontiac bought the GTO to America in 18 months. The Australian Monaro has a dead pedal, however Pontiac had concerns that it would not pass Federal crash standards. Without enough time to test it fully, Pontiac removed it for the 2004 model year. NewAgeGTO has learned that Pontiac has now fully tested to the dead pedal, and it will be included on the 2005 Model year. 16. Why does the GTO have a true dual exhaust, but a single outlet? Pontiac ordered the GTO be bought statside as cheaply and quickly as possible. Therefore, money was only budgeted for a new front clip, not a rear one. Since the Monaro has a cutout in the rear valance for a single exhaust tip, Pontiac was forced to work with it. There will be a new rear valance with proper dual cutouts for the 2005 model. 17. What are the color combinations available on the GTO? 18. Why are there no hood scoops on the GTO? Basically they could not be completed in time. They will be included in some way one the 2005 model. 19. Why are there no rebates on the GTO and dealers are marking them up?? The GTO is Pontiac's hot new halo car and will have very a limited production, therefore Pontiac feels it can sell all of them with no rebates. This logic is being tested as the cars pile up on dealers lots. This is because dealers are marking them up thousands of dollars and scaring buyers away. Pontiac ,unfortunately, has no way to stop this, but it can be assumed that GTO's piling up on lots will cause the markup's to disappear.